The attention is on you as you cruise the streets in your Polaris Slingshot®, an unorthodox three-wheeled roadster. 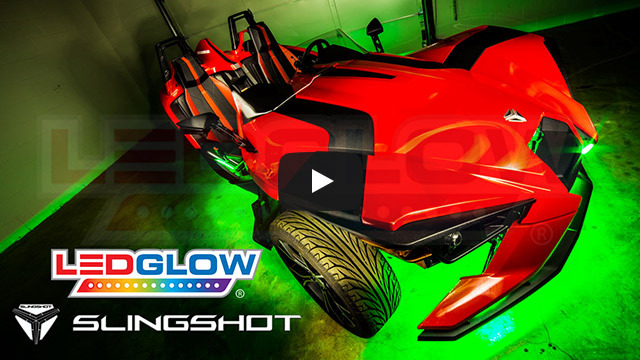 Now you can turn heads by illuminating your Slingshot® with LEDGlow’s Advanced Million Color Slingshot® Lighting Kit! LEDGlow’s Advanced Million Color Slingshot® Lighting Kit with Smartphone Control combines your smartphone device with ultra-bright SMD LEDs to add custom, multi-colored accent lighting to your Polaris Slingshot®. This Slingshot® lighting kit is offered in 3 different options: a 20pc base kit, a 32pc kit and a 50pc kit for ultimate brightness. The included waterproof Advanced Million Color Control Box with Smartphone Control offers total LED control directly from the palm of your hand through the LEDGlow Motorcycle Control App. The smartphone compatible kit allows you to use your iOS (7.0 & up) or Android (4.4 KitKat & up) device to select virtually any solid color via the integrated color wheel and choose from 15 unique patterns from the dropdown menu. The dual zone control feature allows for further color and lighting pattern customization by independently illuminating 2 sections of the Slingshot® simultaneously. The automatic brake light feature illuminates all installed LEDs in red to mirror the Slingshot®’s brake lights, while safely signaling other motorists on the road. The hazard lights feature automatically overrides any color or pattern and flashes amber LEDs warning other motorists on the road. The app features a first-of-its-kind low voltage shut off setting that helps conserve the life of the Slingshot’s battery. If the battery voltage reads less than 10 volts for more than 60 seconds, the kit will automatically shut off allowing you to safely get to your destination. Pair your smartphone to the control box through a secure, Bluetooth 4.0 Low Energy connection. Using Bluetooth 4.0 LE technology greatly reduces power consumption while maintaining a secure point-to-point communication range. This also allows for a quick and easy automatic connection whenever the device is in range of the control box without having to reconnect the device to the control box. Also included with the control box are 2 wireless remotes as an alternate option to operate the kit. Each wireless remote features 4 buttons that select color options, lighting patterns, brightness/speed levels and dual zone control. Each Advanced Million Color SMD Slingshot® Lighting Kit features (2) 36” side mounting wheel well lighting strips to illuminate the tires and rims, as well as 24”, 18”, 11”, 9”, 7” and 3” pairs of flexible lighting strips. Also included are (2) 6pc power harnesses that allow utilization of the dual zone feature, 6pc, 4pc and 2pc add-on harnesses. If the 4’ of power wire per light strip is not long enough to reach the mounting location of the control box, you can use the included 5’, 3’ or 1’ extension harness. LEDGlow is including 3M™ Adhesion Promoter, which is a liquid primer that creates an extra layer of adhesion between the LED strip and the mounting surface of the Slingshot® that will last over time. The quantity of strip pairs, wire harnesses and 3M™ Adhesion Promoter will vary based on which size kit is purchased. Slingshot® is a registered trademark of Polaris Industries Inc. This product is not designed, produced or manufactured by Polaris Industries Inc. LEDGlow Lighting, LLC is not any way, shape or form affiliated with Polaris Industries Inc.